Information and Communication Technologies (ICTs) have immense potential. However, they are created by people for specific purposes; they reflect the interests of individuals and the companies, or organisations, for which they work. They can be used to do good, or to do evil. They usually have unintended consequences. In the context of debates over “development”, ICTs can thus be used for enhancing economic growth, or for reducing inequality. However, can they be used to do both at the same time? Much evidence exists to suggest that with the emphasis over the last 20 years on economic growth as the mantra of “development”, embedded in the MDGs and now the SDGs, ICTs have played an important role in enhancing development (Unwin, 2009). At the same time, though, their design, implementation and use have led to significantly increased inequalities in the world: between the rich and the poor, between men and women, between those with fewer “disabilities” and those with more “disabilities”, between richer countries and poorer countries, between those living in rural and urban areas … Despite their potential to be used anarchically and disruptively, ICTs therefore seem to have been used primarily to reinforce existing power differences and inequalities – both by design and by accident. At its simplest, ICTs usually act primarily as accelerators, both of growth and of inequality. What we mean by “ICT for Development” (ICT4D) depends fundamentally on what we consider “development” should be. If reducing inequality does not matter, and economic growth is indeed the aim of “development”, then ICT4D has been successful. However, for those who are concerned about the implications of an ever more unequal world, as reflected in part in the commitments made towards SDG 10 (Reducing inequality within and among countries), then ICT4D has largely failed. Based on my practice and research over the last 20 years, I have therefore crafted a different kind of book about ICT4D, intended to encourage everyone to reflect on their own roles in ICT4D, and to reclaim the moral agenda about using ICTs to enable poor and marginalised people to empower themselves. It is called simply Reclaiming ICT4D (OUP, 2017). In concept, it draws heavily on Jürgen Habermas’s Critical Theory focusing on interests, on empowerment and emancipation, on the complex intertwining of theory and practice, and on the power of self-reflection. Placing the poor at the centre of all that we do – working with the poor, and not just for them. 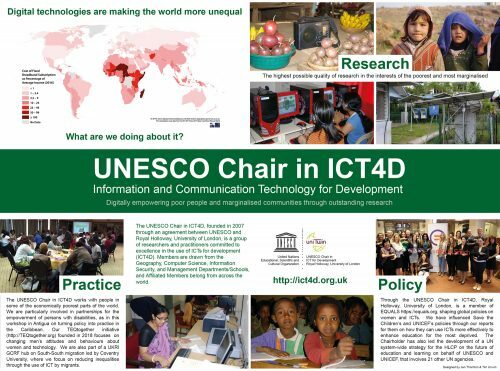 For those attending the 2017 WSIS Forum in Geneva, the UNESCO Chair in ICT4D is convening a workshop on Reclaiming ICT4D at 11.00 on Friday 16th June (Room Popov 1). Do join us to discuss these issues, and to develop an agenda that will enable the poorest and most marginalised to be empowered through the appropriate use of ICTs. Outputs will be reported on the UNESCO Chair in ICT4D platform. Above all, ICT4D is a moral agenda. It is about what is right and what is wrong. It is about what each of us does to make a difference.